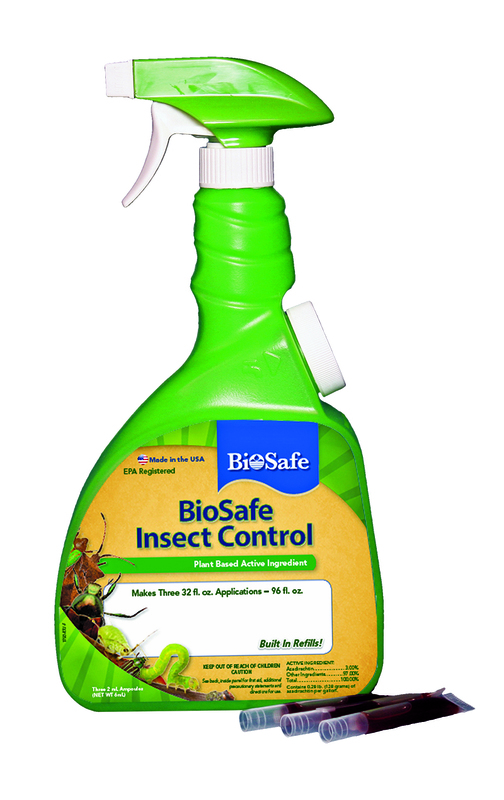 BioSafe Insect Control is a non-toxic insecticide that repels insects, inhibits growth, feeding, and reproduction, minimizing insect damage to plants. 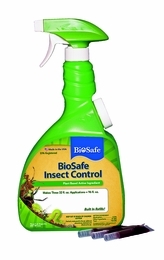 BioSafe Insect Control is an all around sustainable product in its ingredients and packaging. The unique packaging allows you to have three individual refill applications and the use of 96 fl. oz with the purchase of one product. Aphids, Armyworms, Beetles, Borers, Caterpillars, Chafers, Cutworms, Grasshoppers, Grubs, Lacewings, Leafminers, Loopers, Mealy Bugs, Mites, Mole Crickets, Nematodes, Scales, Thrips, Weevils, Whiteflies. � 3 uses with one bottle! Just add water! � The bottle contains three easy to use ampoules which contain the botanical insecticide. � Remove one ampoule from the pouch on the front of the product container, open the side cap and pour the botanical concentrate into the empty bottle, fill with clean water, and return the cap.